Imagining my mother as a young woman in her early twenties — blithe and unencumbered and in love with my young father and before she gave life to my brother and me — is difficult, but that’s because imagining her as an older woman is impossible: she died when she was just 46. I watched for three years as she suffered, as cancer spread from her lungs to her liver and finally to her brain. I was 18-years-old and had just graduated high school. I’d rub her neck when the pain from being bedridden was overwhelming, spread salve over the bed sores that formed on her back and legs, and brush her wig before she attended family parties or my hockey games — my mother liked looking good, even while walking through death’s door. I fought with her about whatever 17-year-old boys fight about with their mothers, unaware how much the 30-year-old version of myself would regret having wasted his last years with his mother on arguments about curfews and C-minuses. 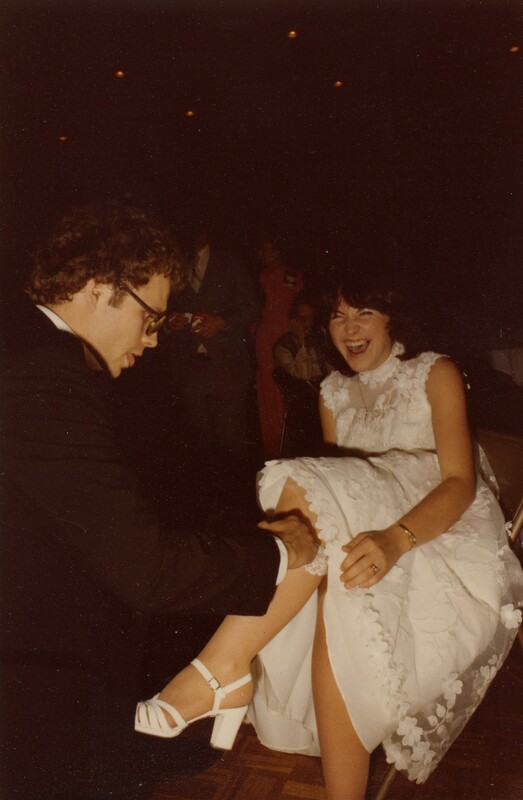 I watched as my father knelt at the bed of his best friend and embraced her as she drew her final breath. And I watched as family and friends threw handfuls of dirt into a hole, cementing my mother’s passing as permanent. Those were not the images of my mother I wanted to recall, but death is a skilled manipulator, able to pervert and obscure the parts of our past that were good and replace them with the parts that were not. I lived with those images for more than a decade, but then I found that box. Inside I found concrete evidence that my mother’s life didn’t begin when mine had, in January, 1985. 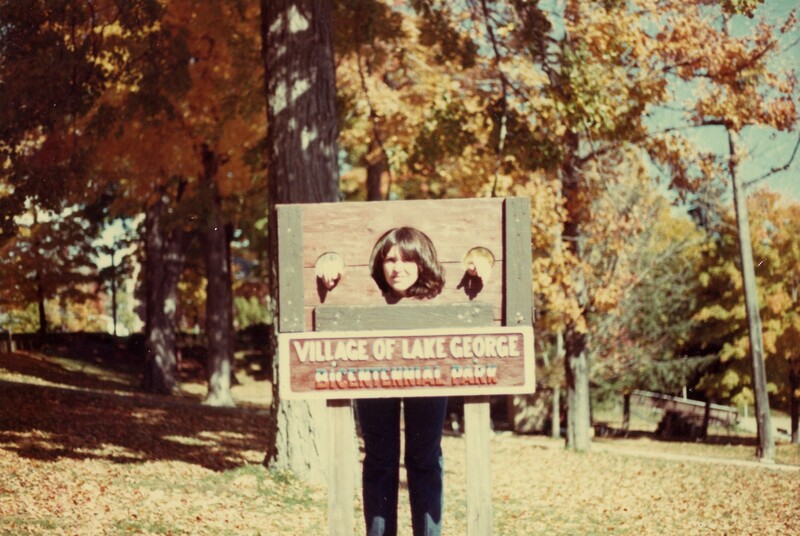 There was a photograph of my father removing my mother’s garter on their wedding day in 1979, and another, taken by my father on their honeymoon a week later, of my mother immobilized by a pillory in Lake George, NY. 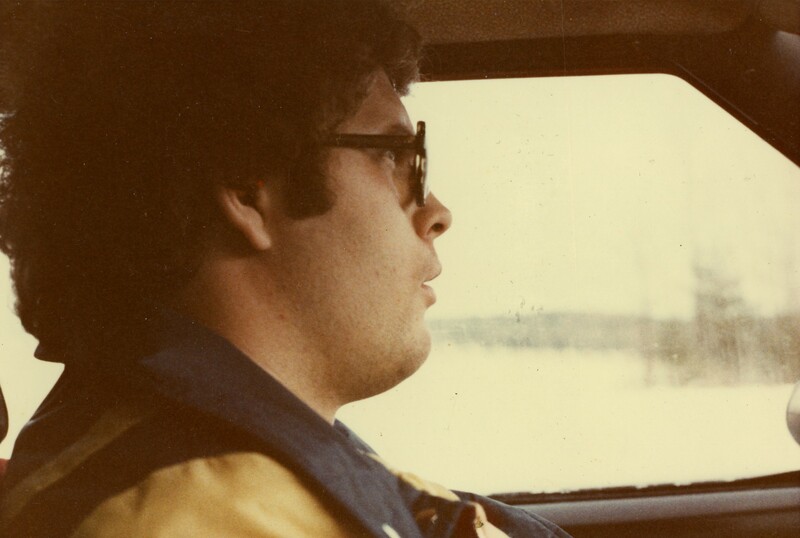 There was another from their honeymoon, a candid shot of my father in profile as he drove their brick red AMC Hornet hatchback down some two-lane highway in upstate New York toward the Baseball Hall of Fame (a concession on my mother’s part, no doubt). 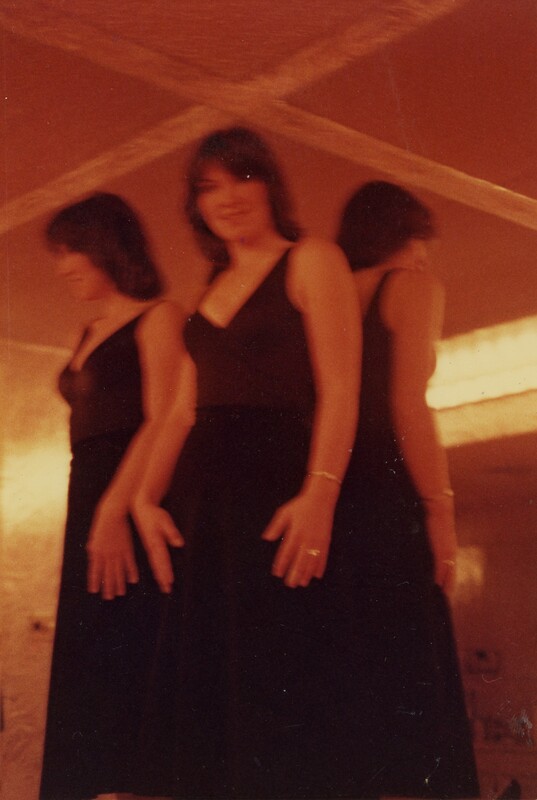 One of the bed in their honeymoon suite, its crushed red velvet headboard in the bokeh and faded by the passing of time; a blurry shot of my mother standing in one corner of that suite, it’s mirrored walls and the angle of the lens capturing a triptych of her frame. Blithe, unencumbered, in love. 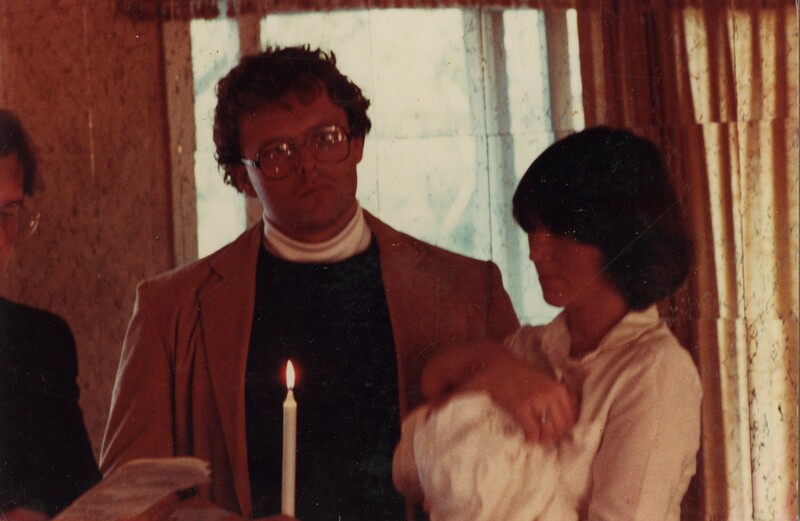 Then I came upon a photograph of my mother standing by my father, cradling her first born, my older brother Sean, during his baptismal blessing. Four months before that photograph was taken, my mother was eight months pregnant and she and my father were preparing for the next phase of life. They’d enjoyed one another within the framework of marriage for two years, and decided it was time to introduce children into the happily ever after. Four hours after his birth on August 11, 1981, my brother suffered a massive stroke, one which permanently paralyzed the right side of his body and rendered him all but blind. He very nearly died, and because he required constant monitoring for the first three months of his life, my parents couldn’t take him home. My mother, then just 24-years-old, set up camp at Boston Floating Hospital and slept in a chair by my brother’s incubator for the duration of those three months. My brother’s doctors decided it would be okay for my parents to take him home for an afternoon to be baptized. To the objective eye, the photograph is of any old baptism. To me, the photograph is of a devastated young husband and wife, my mother’s eyes puffy and tired, my father staring vacantly at something out of frame. When I was 24, I was working on a master’s degree in writing and publishing in Glasgow, Scotland. Which is to say I was drinking whatever scotch my student loan money could buy, smoking a pack of cigarettes a day, jumping from one bed to the next, and going to as few lectures as I could while still getting solid enough marks to graduate. I roamed around France and Italy, lazy and disinterested — I thought I was Ernest Hemingway, but I was really more like Ernest Goes to Europe. By contrast, my mother at 24 was living in a hospital and praying her newborn son made it through each night. She walked through Boston’s combat zone — then home to a glut of the city’s prostitutes, drug dealers and violent criminals — to get coffee or cigarettes or a break from the buzz of the tubes and wires attached to her baby’s body. My brother survived. 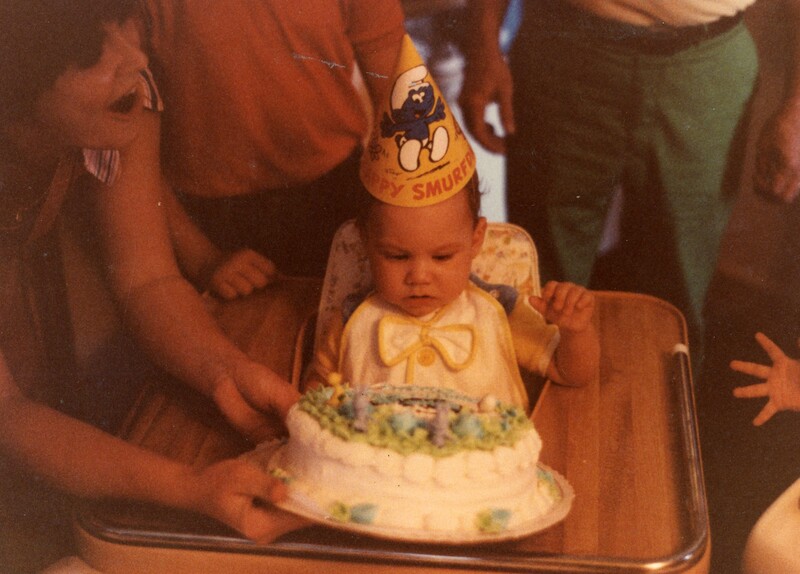 The photograph taken at his first birthday party, nine months after trading his incubator for a crib, is proof of this. You can see my mother peeking in at the left, perched above my brother after helping him blow out his candles. She’s smiling, but to me it’s more a look of relief than one of joy — a year after what was supposed to be the happiest day of her life, and finally she could relax. What I didn’t find in the box were photographs of my mother smoking pot out of a World War II era gas mask or puking on the front lawn of her childhood home the first time she got drunk. I didn’t find photographs of her standing beside her 1967 Camaro (yes, my mother drove a 1967 Camaro because she was a badass) or photographs from her senior year in high school, during which she reportedly skipped 40 days but still managed to graduate — the apple doesn’t fall far. I know these things happened because I’ve been told these things happened, but I can’t help feeling a bit robbed because I never heard these stories from her. We never had an adult relationship; she made sure she didn’t reveal too much. As a result, I never felt as though I really got to know her. At least not as well as I would have liked. There was one more photograph I found in the box that struck me: I’m two-years-old, crawling across my grandmother’s coffee-table while my uncle and my cousin lounge on the couch behind me. The walls of my grandmother’s living room were covered by full-length mirrors (a big thing in the seventies and eighties, apparently), and so you could see the photographer, who was my mother, in the background. It’s the earliest photograph I could find of my mother and me. The couch from that photograph wound up getting passed down to my family. There was a period of time when I was younger — it lasted four or five years, between 2nd and 6th grades — when my mother became obsessed with upholstering and reupholstering that old couch. Each year she’d go to Joann Fabrics and look for a new pattern. Pastel floral one year, silvery paisley the next, textured maroon the year after that. I can’t remember if her artistry followed a strict pattern or if it was determined by impulsive flourishes of inspiration, but I seem to remember the frantic tearing of fabric and the soothing whir of her old Singer coinciding with the beginning of each new school year — my brother and I got new jeans and Nikes, my mother got a new couch. That was my mother — skilled with her hands, always tinkering with one project or the next. When the radiator in her car sprung a leak, she’d telephone area scrap yards till she found a replacement, haul it back to our driveway and fix it herself. When the vinyl floors in our bathroom began to bubble and peel, she’d tear it up, grab the grout and lay new tiles. When the shingles on our home appeared too weathered, she’d power wash them clean. And when spring arrived each year, she’d spend hours tending to her lily gardens. Those are the images of my mother I wanted to live with. Luckily, I found that box.